I will have the original 40″X24″ painting on hand, as well as, some of the limited edition and special anniversary prints on hand to sell. The print size is 19″x28.6″ with an image of 16″x26.7″. The prints depict the 62nd Pennsylvania Volunteer Infantry, as part of Colonel Jacob B. Sweitzer’s Second Brigade, First Division, Fifth Corps on the evening of July 2, 1863. The timing of the conflict was during the Wheatfield battle of the great Gettysburg campaign. Many of these brave soldiers came from my home county of Armstrong County, Pennsylvania. There are 450 of the regular limited-edition prints signed and numbered. The cost each is $100.00. A total of 45 Artist-Proof prints will be signed and numbered. The cost of this print is $120.00. A special anniversary print has been printed, also. These prints will be limited to 150 in remembrance of the 150th year anniversary of the Civil war as well as the “Wheatfield” battle of July 2, 1863. To the right of each numbered print will be the words, “150th Wheatfield Edition. 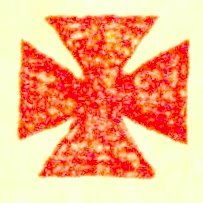 Also, a simple red Maltese Cross will be hand drawn and colored. 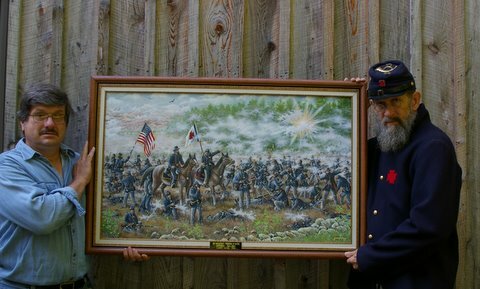 The 62nd Pennsylvania Volunteer Infantry often wore the cross on the “Kepie” hats and uniforms. The price of this print is $150.00. If interested in obtaining any of these prints, please contact me and I will supply all details as to payment and to whom, etc. My e-mail is: lasmail@windstream.net.